As Winter rolls around, most of us tend to put our holidays on hold, instead anticipating those balmy Summer days arriving again and taking respite hiding within our comfortable routines. 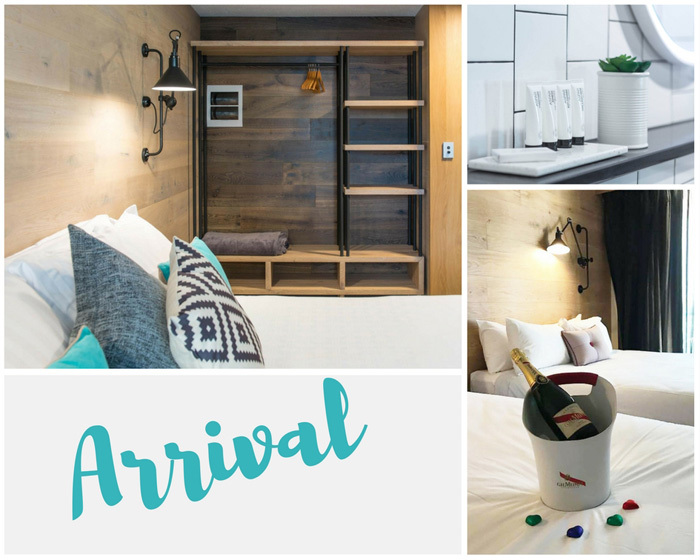 With a longing to break the Winter blues cycle, I decided to instead embrace this year’s cooler season with a mini getaway, and thought there was no better place to escape to with my partner for the weekend, than discovering the newest jewel in Gold Coast’s crown. Forever changing, growing and evolving, the Gold Coast’s main precinct of Surfers Paradise is a constant place of transition, from its ‘50s retro days of fibro beach shacks, to the bikini parading meter maids, the rise and fall of skyscrapers and the addition of the light rail, it is the identifiable suburb which draws crowds from all over to relish in its laid-back beach vibes contrasting with the bright lights and energy of a city. Making its own transition throughout the years, The Island Boutique Hotel has recently been exclusively refurbished, re-vamped and re-launched from its former identity of The Islander. Set in the heart of Surfers Paradise, The Island is an iconic resort destination in its own right, arriving to the modern-day landscape of luxe boutique accommodation. As my partner Bryce and I arrived to the reception area on the first floor, we were met with a fresh and modern space, styled with raw timbers, lavish leather couches and period artworks adorning the walls, giving nod to the beach era past, where a coastal theme is seamlessly carried throughout the entire resort. The reception staff, which work around the clock, 24 hours a day, were nothing but warm smiles, welcoming us for our weekend getaway and reserving us a table that night to dine in-house at the resident restaurant, The Island Bistro. Upon opening the door to our superior twin room on the 8th floor, Bryce discovered a pre-arranged gift I had organised of a bottle of champagne on ice and novelty chocolates presented beautifully atop the crisp white bed linens. The bathrooms are contemporary in style with white tiling lined in monochrome finishings, whilst the finer details of a rainfall shower, complimentary ASPAR products and potted greenery create a tranquil spa like feel. An open timber wardrobe has been fitted ensuring plenty of storage for luggage, whilst the mini bar and fridge are stocked with gourmet delights and beverages offering a light refreshment or snack. As we popped our bottle of champagne and poured ourselves a glass, we took to the balcony to enjoy the warmth from the afternoon sun, taking in the view of the city and watching the rolling waves of the Pacific Ocean, we both let out a long sigh as a feeling of relaxation washed over us. As dusk began to fall, we glammed ourselves up to explore The Island Rooftop. As if a staircase to heaven, we were greeted with an ambient glow of twinkling overhead fairy lights contrasting with the city skyscrapers beyond, the Gold Coast skyline creating a backdrop just as picturesque after dusk as it is after dawn. The sprawling deck has been fitted out with an abundance of natural flora, raw timber bench seating, bar stool tables and scattered Acapulco chairs, creating a stylish and relaxed space with a high-end Hamptons feel, inviting us to stay a little longer and sip on aperitif cocktails whilst indulging in conversation. 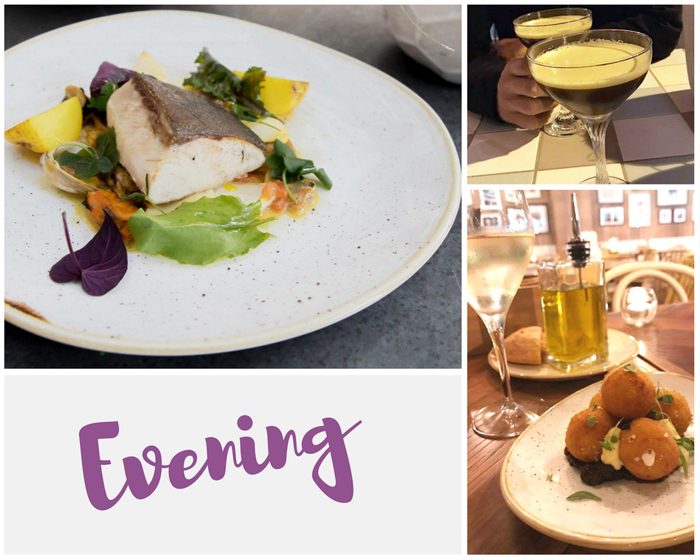 As our dinner reservation time rolled around, we were famished and eager to experience all that the Italian inspired bistro had to offer. Walking past the open-air kitchen to our table, our appetites were stimulated with the aromatics and view of the wood fired pizza oven. Once seated in the restaurant my eye was immediately adverted upwards to the wicker cane pendent lighting above, imitating an almost jelly fish like flotation display overhead, whilst an eclectic mix of warn timber seating and boating memorabilia added to the seaside sentiment. Selecting a glass of Little Angel Pinot Gris for myself, Bryce opted for a subtle Save Our Souls Pinot Noir, whilst we shared a basket of warmed sourdough bread and entrée of silky arancini Milanese with saffron, fontina and pepe verde. For the main affair, I chose the perfectly cooked pan-fried Kingfish fillet with mussels, clams and cuttlefish cooked in saffron with a side of garlic potato and herbs. As recommended to match his glass of red, Bryce chose from the pasta menu, devouring a bowl of braised squid and chorizo freshly made pappardelle. As we made our way back to our room, we discussed what a truly memorable meal this had been, finishing off our night perfectly watching an in room movie. 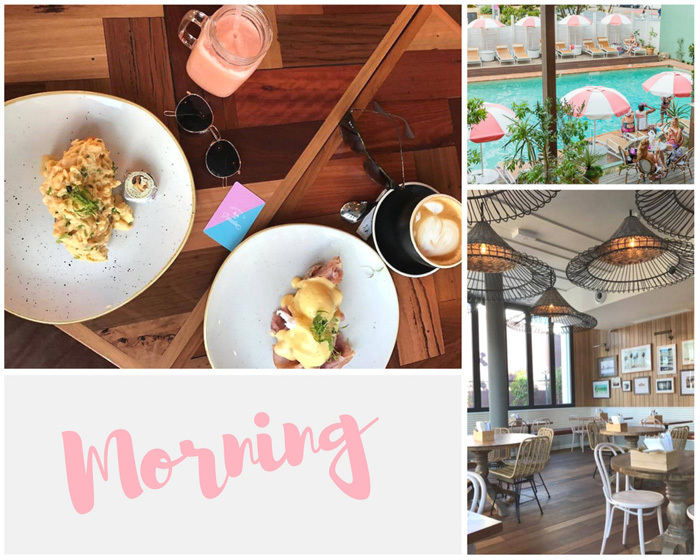 Awaking to another spectacular Gold Coast day, we headed to the pool for a refreshing dip and soak in the spa bath before lounging ourselves on the sunbeds, waking up slowly with an espresso coffee from the restaurant and flicking through the morning paper. As our stomachs began to rumble, we took a seat for breakfast in the light filled dining room. With an inventive morning menu, The Island Bistro offers dishes to suit any taste, from fluffy butter milk pancakes to brioche bacon and egg rolls with provolone cheese and garlic aioli, however the scrambled eggs and eggs Benedict with free range smoked ham on sourdough drizzled in hollandaise sauce were both divine. Feeling completely connected, revitalised and recharged, we reluctantly checked out. Speaking words of gratitude for having such a luxurious location at our door step, we agreed this was the perfect mid-Winter pick me up we needed, knowing it wouldn’t be long until we would return again. AGFG was a guest of The Island Boutique Hotel, Gold Coast, however, Freya’s opinion is her own. For more information and to book your Winter escape to The Island, Surfers Paradise, check out their website: www.theislandgoldcoast.com.au. By Freya Ensbey of AGFG. This article originally appeared as “Embrace Winter with a Romantic Escape to The Island, Surfers Paradise” on the Australian Good Food Guide on Monday 24/07/2017.